Home » Recipes » Gluten Free » Root Vegetable Recipe: Sweet Potatoes and Carrot Soup! Sauté garlic, ginger, and onion in oil until soft then add in chopped vegetables. Cook the vegetables for two minutes, stirring often, and then add in low sodium chicken stock. Bring to boil then reduce to a simmer and cook until the vegetables are soft. Transfer to a blender and puree until smooth. Stir in butter then salt and pepper to taste. Enjoy this delicious dinner with the whole family to stay warm! It’s rich in vitamins A and C, so this sweet potato and carrot soup will help keep the flu away for your family. Don’t forget to get the kids in the kitchen helping to prepare the soup– they can scrub the veggies, measure the ingredients, peel the carrots or put out the soup bowls and spoons! 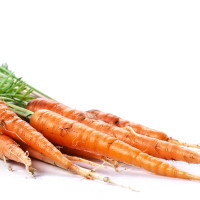 Comment on Root Vegetable Recipe: Sweet Potatoes and Carrot Soup!